A bell is a simple musical instrument. Most bells are made of metal. Bells are also in churches to announce the time between hours. Ships usually carry a ship's bell. Alarm bells warn of danger. Some bells are in bell towers. 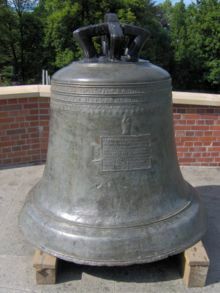 The Simple English Wiktionary has a definition for: bell. This page was last changed on 26 December 2016, at 20:15.